The Pelvic Health Program is carried out by a pelvic health physiotherapist and focuses on treatment of incontinence, pelvic organ prolapse, and pelvic pain in both men and women. Dufour 2016 study found a 96% correlation between low back pain and pelvic floor dysfunction in women. “Common” = “Normal”– NOT true! Leakage of any kind, at ANY age is common but NOT Physiotherapy can help address this. Kegels are good for everyone- NOT Most people are hypertonic and therefore need to work on relaxation of tissues before strengthening occurs. Pelvic Physiotherapy only treats incontinence- NOT We can address a number of pelvic issues. People don’t want to talk about this area- NOT The prevalence and impact on quality of life is so high, it is crucial that we as health care professionals make discussions around these issues comfortable and normalized. Includes external and, if consented to, an internal assessment that looks at pain, tissue resistance, scarring, strength and coordination. 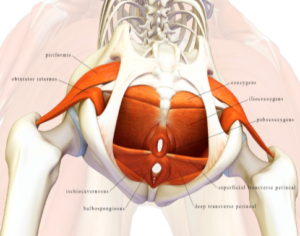 The pelvic floor is closely associated with the back, SIJ and hips, having direct muscular attachments and similar innervation which is why a comprehensive internal and external assessment is important.